The Sonoran Sun is one of the most luxurious resorts on Sandy Beach. The resort has a very grand tiled corridor where you will find the on-site convenience store and check in lobby. The resort has many five star amenities like a state of the art fitness center, Emiliano's Restaurant and Bar, beachfront swimming pools, Jacuzzi, BBQ's, palapa's , and a full service spa. 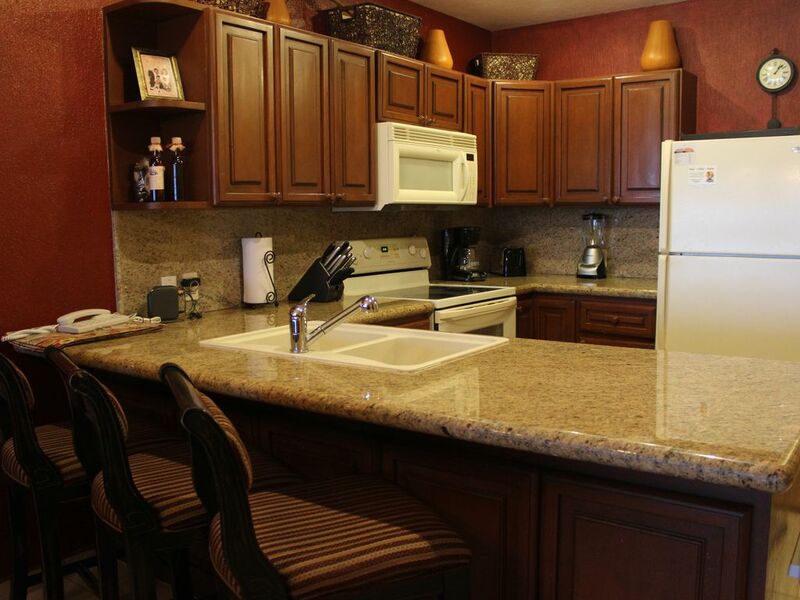 You will be in for a real lap of luxury when you stay at the Sonoran Sun. This is truly paradise! This two bedroom and two bathroom condo is located on the 7th floor of the East Tower. This condo can sleep 6 people; two in each bedroom and two on the queen size sleeper sofa in the living room. The living room of this condo is furnished with a tan colored sofa and love seat. The room is decorated with a coffee table, end tables and a double door media cabinet. The media cabinet has a TV, DVD, VCR and CD player. The condo comes equipped with high speed wireless internet and cable television. You can access the terrace through the sliding glass doors off the living room. The dining room has a round wood topped table with seating for five. The kitchen has dark maple wood cabinets, granite counter tops and white on white appliances. The kitchen has a built in bar lined with three matching bar stools. This kitchen has everything a five star chef would need to prepare a delicious gourmet meal. The only things you will need to provide are the food and drinks. The master bedroom has a large king size bed with a high head board covered in sage green fabric. The bedding is a red and yellow floral pattern. The room has two lighted bed side tables and a matching dresser. There is also a wicker arm chair with ottoman near the sliding glass doors that provide access to the terrace. The room also comes with a large double door closet where you can hang your clothing. The master bathroom has a double sink vanity with a walk in shower and commode. The 2nd bedroom has a bunk bed set with a queen size on the bottom and a full sixze on the top. The bedding is a gray floral pattern with matching pillows. The room has a bed side table and dresser. The room also has a large double door closet where you can hang clothes if you need to. The 2nd bathroom can be accessed through the hallway or the 2nd bedroom. The 2nd bathroom has a single sink vanity with a walk in shower and commode. The terrace is furnished with a round table, chairs and two fancy chaise lounges. You can enjoy your dinner outside while you watch the sunset over the Sea of Cortez. You can also kick back and relax with a cold beer or glass of wine and watch the tide roll in and out. Wake up in the mornings and have your coffee outside while breathing in the salty ocean air. The condo also comes with a washer, dryer and ceiling fans throughout. You will not be disappointed with the comfort and luxury of this condo. Check now for rates and availability. Book your vacation now! Paradise awaits you! There was a very nice view from this room but the Sheets had yellow stains and towels were stained also the shower curtain was filled with soap scum from previous guests - refrigerator light was turning on and off and was leaking water. Lastly the resort security banged on our door on the last day accusing my partner and I of smoking on balcony, it was very intimidating and they ended up apologizing because it was the wrong room. Cute condo clean, nice view.. the only thing I noticed there was no toilet paper in master bathroom which was and easy fix also after running the restroom sink water for a minute a noticed an awful smell almost like sewer I just used bottle water to brush teeth also an easy fix. Beds were decent as far as comfort. Overall opinion it was a great place to stay. This condo was amazing it was my husband, kiddo, and in-laws. Plenty of room & comfortable. Everything was explained perfectly and when my son left some items behind they did a great job retrieving those items. Great location and the view was awesome! I love this room. It was decorated great and had the best most comfortable beds!